I missed the memo about thanks, waste, and the good Tupperware. It’s the Sunday after Thanksgiving and it’s been a lovely four-day weekend full of chopping, mixing, blending, and baking. Due to my delicate condition, we begged off travel and other festivities and opted to stay home for a quiet holiday. But I’m thankful that I’m still capable of cooking, so I spent a good portion of the weekend literally barefoot, pregnant,and in the kitchen. We had a good meal with a lot of our traditional favorites. Then yesterday, while still suffering from a bit of a tryptophan hangover, I happened to tune in to a Food Network special called “The Big Waste“. It was a competition of sorts which pitted two teams of Food Network chefs against each other in a challenge to see who could create the tastiest dishes at a banquet for 100 people. The catch was that all the ingredients they used had to be rescued from the refuse. Yep, you got that right…everything they used for their recipes was stuff that was about to be thrown out. So the chefs set out and explored farms, wholesalers, and restaurants and what they found was astounding. Lots and lots of high-quality, perfectly edible food that was sometimes moments away from a garbage can or a compost heap. And why? Mostly because of cosmetic imperfections. The American consumer has been so conditioned to expect pristine and pretty food that we turn our nose up at every tiny bruise and blemish, and actually pass over the ripe, flavorful specimens to get to the more perfect looking, but sometimes less tasty options. I admit to being a food snob and a food safety nazi, so I have probably thrown away way more than my share of food in my lifetime. And now I am taking stock of the fridge full of Thanksgiving leftovers and pondering their fate. Using Alton Brown’s recipe, I’ve transformed a whole mess of turkey into some pretty tasty turkey salad. Add an egg to the mashed potatoes and they’ll fry up as passable potato pancakes, I suppose. But after seeing the extraordinary amount of food that goes to waste in our country, I feel challenged not to squander the remnants of this feast that we were so lucky to have. So how do you creatively repurpose your leftovers on Thanksgiving and other times of the year? And more importantly, how do you keep all those lids from going rogue? Still digesting and memo received. I want to see that program! 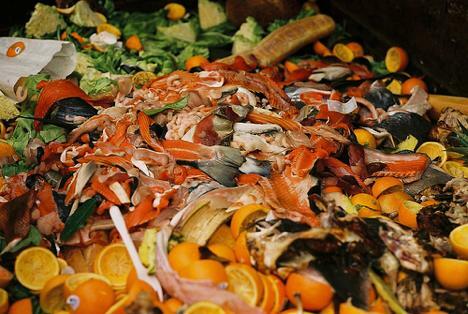 I have serious anxiety over food waste. I really try to be efficient and use what we have. I would feel much more pride making a pinterest board of repurposed leftovers than of cute kid desserts or attractive bathroom storage. Three basics: soups, stir fries, and enchiladas. Oh, sometimes omelettes. Stick leftovers in omelettes. With basil or cilantro. Preferably with a glass of white wine for lunch like Alton Brown suggests. But I only managed that once, the white wine accompanying the omelette. And it was at 11pm. I like those ideas! Especially the wine part! Thank you, Sheila! I really appreciate your positive feedback and support. You are the best!